For Part 1 (file uccle_02.html) with the years 1997 to 2002 click here! 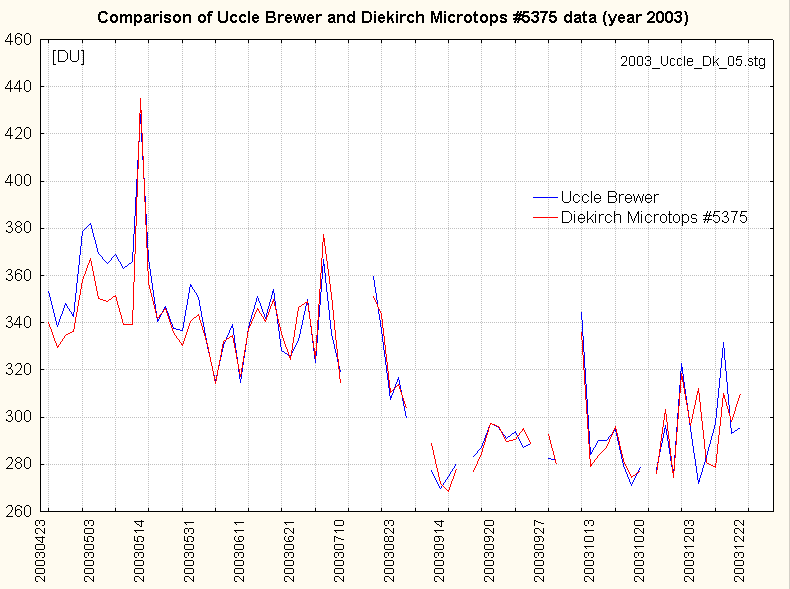 Summary A series of year-long comparisons between total ozone column measurements done with a Brewer at the RMI at Uccle (Belgium) and the Microtops II sunphotometer at Diekirch (Luxembourg) shows a good linear relationship between both instruments. From 1997 to April 2003 the Microtops #3012 has been used; from April 24th 2003 it has been replaced by Microtops #5375 as the main instrument; however both spectrometers were operational during the remainder of 2003. A previous report suggests to apply a multiplier of 0.93 to 0.95 to the Microtops #3012 readings which are most of the time in excess to the Brewer (and the #5375); the agreement of the newer #5375 instrument and Brewer is much better and practically does not need any adjustment. 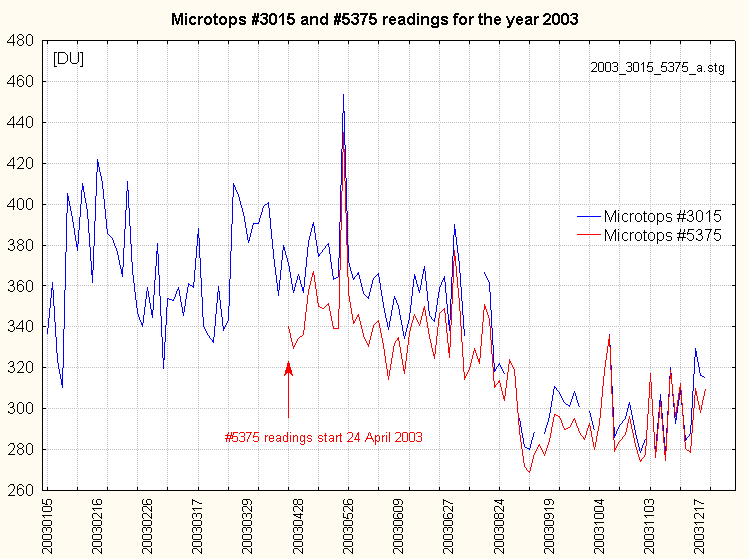 The Microtops II #5375 was last calibrated at Solar Light Co. in December 2002. This paper also compares the Brewer and Microtops readings with those of the TOMS and the GOME satellites for 2003. 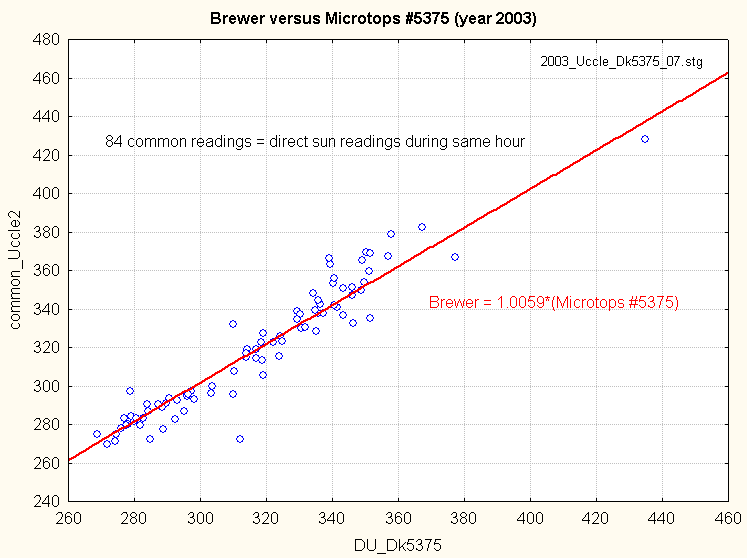 The conclusion from the years 1997 to 2002 comparison between Microtops #3012 and the supposed correct Brewer DS measurement is to apply multiplier of 0.93 - 0.95 to the Microtops readings to give a good agreement with the Brewer. 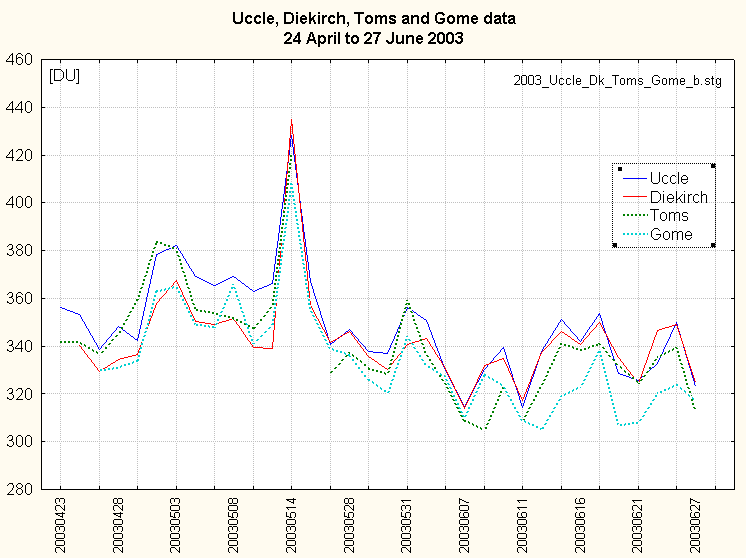 During the whole year 2003 all total ozone column measurements were done at Diekirch with both Microtops instruments. The main differences between the 2 instruments are in slightly different wavelenghts used to measure the ozone thickness and minor firmware modifications. Instrument #3012 uses the 3 wavelengths 300, 305.5 and 312.5nm, whereas #5375 uses 305.5, 312.5 and 320.5nm. A linear fit forced through the origin gives: #3012 = 1.046*(#5375): the older readings are about 5% too high (in accordance to the conclusions found for the previous years), and should divided by 1.05 to agree with the Brewer. This should be the calibration correction to apply to the previous years (1997-2002) measurements, assuming that the new instrument is more accurate. There are 84 readings allowing a direct comparison between Brewer and Microtops #5375; please note that only DIRECT SUN readings taken at times less than 1 hour apart have been retained (these will be called "common" readings)! The mean values are practically the same! There are some major differences for the first 11 Microtops readings (24 April to 11th May) with Brewer data being higher; later both series are nearly the same. Dr. De Backer told me [ref. 4] that the Brewer #016 had been recalibrated in May 2003, because it was running too low; this is quite strange, as the first Brewer readings seem too high! This graph gives all 132 Direct Sun readings available, including those where only Uccle and/or Diekirch readings were available (but not necessarily both)..
differ by more than 0.6%, what is a remarkable good agreement! 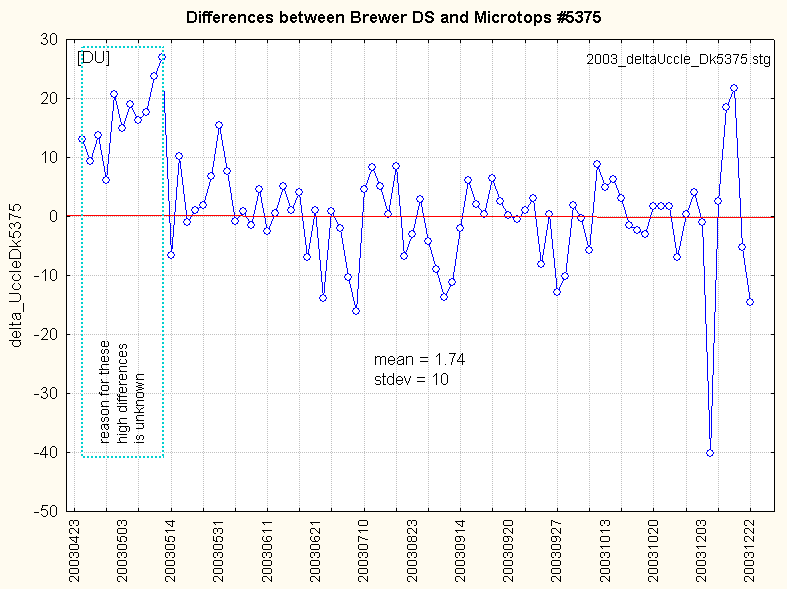 The left plot shows the differences between Brewer and Microtops; the overall mean/stdev is 1.74+/-10. It should be noted again that the Brewer data are much higher than the Microtops from 24th April to 11th May (mean difference is 14.7 +/- 7.2); the reason is still unknown. Solar zenith angle can not be the cause, as the same SZA go with much smaller differences during the fall of the year. If one excludes the starting period and the obvious outliers of 6th, 9th and 10th Dec, there is very small negative trend of about -3 DU for the period 14th May to 22th Dec 2003 (negative means Microtops readings are increasing regarding to Brewer). The distribution of the differences of the "common" readings is nearly normal, with one outlier at the high end. Uccle and Diekirch readings will now be compared with those of 2 satellites: Nasa's TOMS  which passes Uccle every day at approx. 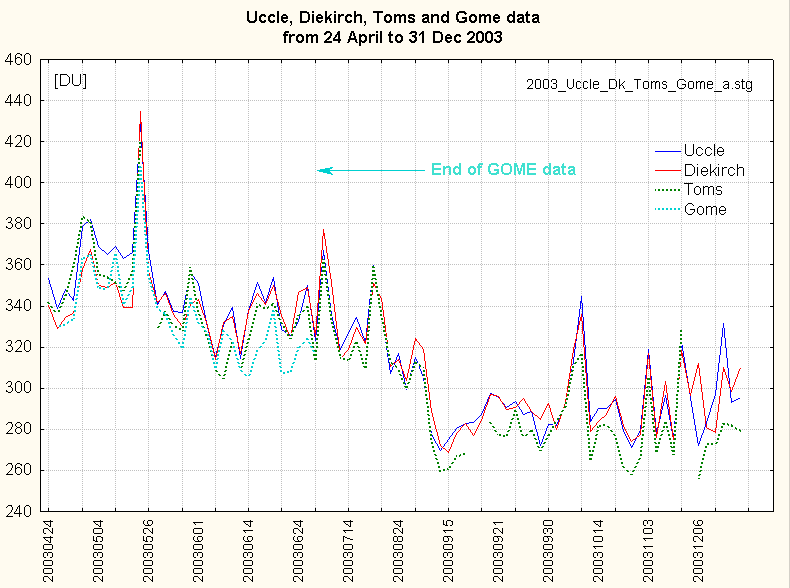 10:00 UTC (+/- 30 minutes), and the now defunct GOME's instrument assimilated data  on the European ESR-2 (assimilated means the actual readings are interpolated or computed by applying a model to the same hour as the Uccle/Diekirch measurements); it should be noted that the TOMS data are taken up to 2 hours earlier to the Uccle and Diekirch readings. 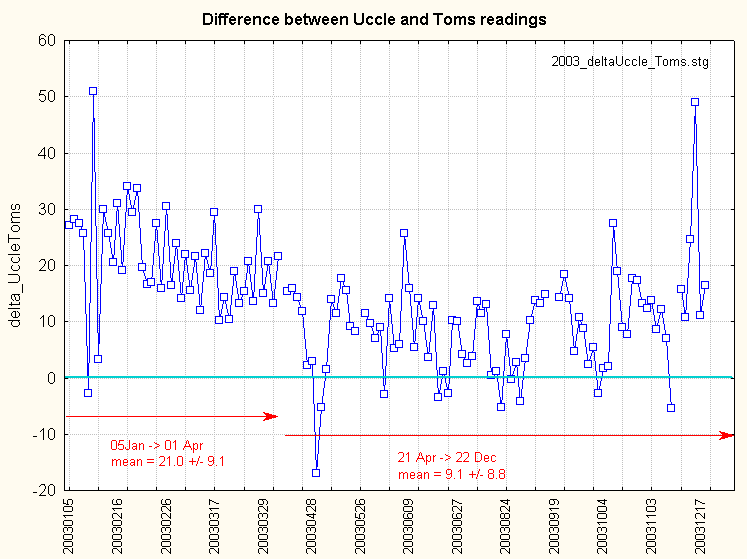 The greatest differences exist between the Uccle and the satellite data; the Microtops mean values are in-between; even if some Toms values are much lower than Uccle's at the start of May, they are not systematically lower for the full period from 24th April to 11th May (which could suggest a Brewer problem). The Gome data are practically always the lowest of the 4 sensors. The Microtops II #5375 measured mean total ozone column is virtually the same as the mean value from the Brewer direct sun measurements. 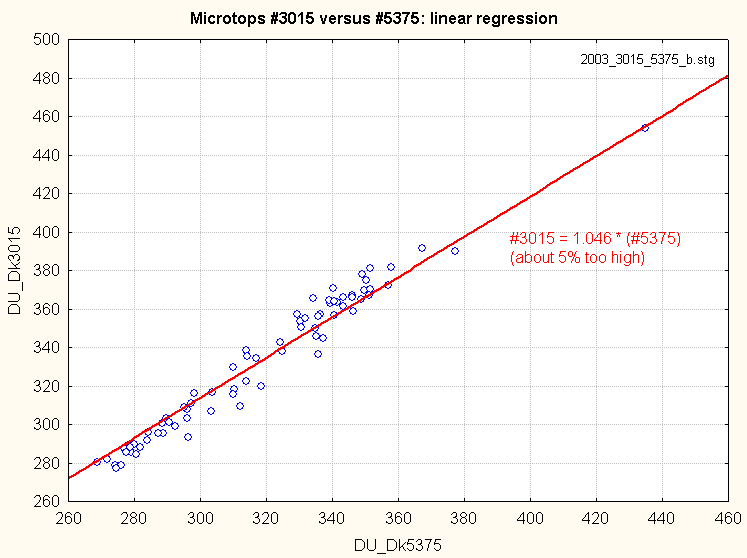 In this comparison the "corrected O3" data from the Microtops have been used. Most of the time the absolute differences are in a [-10, +10] DU interval. 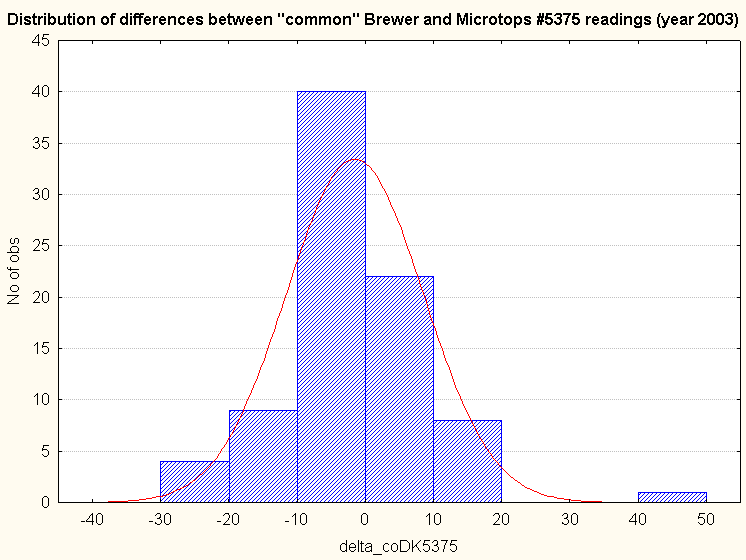 The new Microtops (#5375) gives usually much better agreement with the Brewer than the previous one (#3012), there is no need to apply a corrective multiplier. The Microtops mean values are closer to the Brewer than are those of the TOMS and GOME satellites. It should be noted that good operational practice of the Microtops requires careful pointing to the sun , and is best done by the same operator. Special thanks to Dr. De Backer of the Royal Meteorological Institute of Belgium (RMI) for providing the Uccle Brewer data and his continuing help.